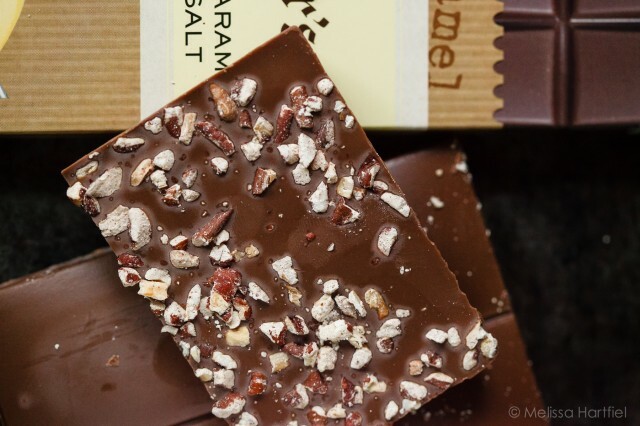 A few months ago I reviewed one of the best chocolate bars I’ve tried in a very, very long time. 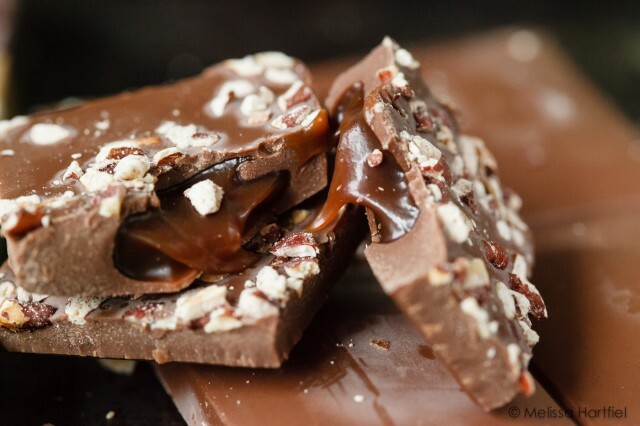 The Bissinger’s Coconut Caramel Bar. It was a perfect blend of chocolate, coconut and salty, thick caramel. 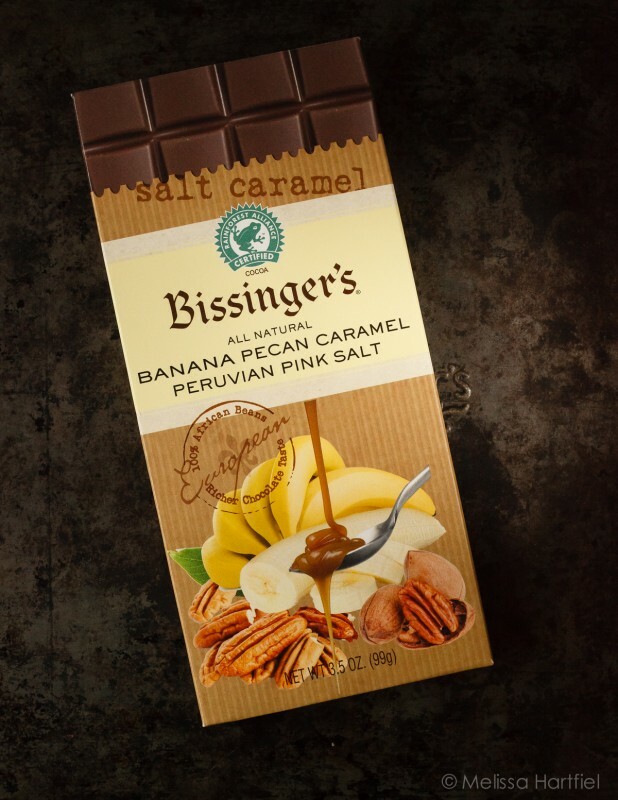 So, you can imagine my excitement when I was out shopping and found another Bissinger’s bar in Urban Fare – the Banana Pecan Caramel Peruvian Pink Salt bar! I snapped it up without even thinking twice about it and couldn’t wait to get it home to sample. I have to be honest and report that this was a disappointment. First of all, upon opening the bar, you could see that the chocolate had “bloomed” a little so it probably wasn’t the freshest it could have been (eating chocolate that’s bloomed won’t harm you). Upon tasting it, the chocolate still had the rich flavour that it’s coconut caramel counterpart had. And the caramel was still thick, rich and had that perfect salt finish that the other bar had. Pecans are alright but I have to confess, I’ll take toasted coconut any day over pecans. But here’s where it gets sad. The banana flavour. It wasn’t good. As a kid, I spent a lot of time every winter suffering from a nasty case of bronchitis which required antibiotics. Those nasty, banana flavoured antibiotics. And all I could think of while eating this bar was those horrible antibiotics. As I mentioned with the coconut caramel bar, Bissinger’s flavours are not subtle and that was certainly the case with the banana flavour here. It just didn’t work for me. So this is one bar that I won’t be purchasing again. I’ll hold out for my preferred coconut caramel bar next time I’m on the hunt for a Bissinger’s bar. Now that’s an awesome bar of caramel chocolate! While I do use a lot of reflectors or foam boardwhen I’m photographing indoors to bounce light, I often find it doesn’t focus the light exactly where I need it. They’re great for bouncing light overall and giving you more light but sometimes you really need to bounce light to a specific part of a scene. When I photographed the bar on its own (the top shot) it wasn’t working. So I used a small hand mirror with a stand to get the light exactly where I wanted. It made a huge difference. I’ll do a before and after post soon to show you the difference this one small tool made in making the shot have a little more “oomph”! I have never heard of Bissinger’s Chocolate before, I will have to keep my eyes out for it! Tough to find. I’ve seen them in Urban Fare here on the coast but also, surprisingly, in Bulk Barn in the interior. Haven’t seen them anywhere else. I’m a little sad that you didn’t enjoy this. I was hoping for a great review and then I’d scour every store in my area to find one. It sounded so wonderful and that caramel looks delicious. Not to mention that I love pecans!